The most widely known form of Theatre of the Oppressed, often identified with the name itself, is Forum Theatre. This type of theatre presents a scene which is normally run from beginning to end. Afterwards, it is re-run, but spectators can interrupt (by calling out “stop!”) and take the place of an actor. Usually, the scene is exemplary of a certain type of oppression – workers on strike confront a manager or police officers, a racist swimming pool attendant demands papers from a black family, an authoritarian father throws his daughter out for getting pregnant, and so on. (The script Family, used during the Legislative Theatre process, is included in the book Legislative Theatre and provides a sense of how this works, on the basis of the last of these examples). ‘Spect-actors’, i.e. spectators who take on the role of actors, take on the role of the oppressed person, and try out alternative responses. Suppose, for instance, that the problem being addressed is exploitation in a factory. Members of the audience might try out responses such as leaving the job, going on strike, reasoning with the manager, blowing up the factory, sabotaging machinery, organising a go-slow, and so on. There is no limit to the possible responses, except the audience’s imagination. Unintended consequences or difficulties carrying out actions often become apparent. The performance tests the responses and their effects. Blowing up the factory leaves the workers jobless. Unionising might entail confronting the bosses if they fire union organisers. Actors can then run through ways to respond to these further effects. So they realise, for instance, that if they unionise, they need to be ready to strike if organisers are fired. And often, alternatives unthought-of by the facilitators appear. The point is not to show the correct path. The point is to try out different paths. When a tactic works, other spect-actors then replace the oppressor and try to re-establish oppression. This creates a dynamic situation. The method shows the available arsenals of tactics available to both oppressors and oppressed. Theatrical practice operates as a rehearsal for challenging oppression in everyday life. In principle, the effect of “catharsis” is completely removed. People don’t experience a vicarious revolution as a substitute for real revolution. The rehearsal provides an inspiration for real acts of resistance. The dynamic nature of the situation is both a strength and a challenge. Spect-actors’ interventions create new scripts or responses to the situation. The theatrical techniques are in the service of the people, or participants. This means that flexibility is needed in applying the techniques, and modifications are allowed. Sometimes, a particular solution proposed by a spect-actor requires other characters from outside the initial scenario. This is achieved by recruiting new participants from the audience. Spect-actors often modify scenes and even methods, in ways which reflect their ideologies or psychologies. However, it is not usually permitted to change the basics of the situation, such as the characters’ relationships, the nature of the problem, or the characters’ desires. “Magical” solutions, like winning the lottery, are discouraged – though it is up to the spectators which solutions are deemed magical. The purpose of all forms of Theatre of the Oppressed is to transform spectators into protagonists. This process is meant to cause people to change society, rather than accepting it as it is. In Boal’s words, the objective is to encourage autonomous activity, transformative creativity, and the process of changing oneself into a protagonist. It is intended as an endless process that expands into participants’ lives, providing a source of energy and subjective action. Whereas conventional theatre uses a code of non-interference by the audience, Boalian theatre proposes interference and intervention. This means that, instead of the classical position of catharsis, spectators undergo dynamisation. They see themselves as potential actors in the scenario, who can invade the stage – even if they don’t. Dynamisation – not just avoiding catharsis – is needed, so that people fight oppression and injustice. According to Boal, theatre should be dynamising. It should encourage people to act or “do” things in real life. And it should make people more aware of their own and others’ possibilities. The aim of Theatre of the Oppressed is to turn spectators (or passive oppressed people) into actors (or fighters against oppression). The spectator takes on the role of the actor. Everyone is both spectator and actor, at least potentially. Everyone is a protagonist – the spectator does not delegate power to the actor. Even though some people might choose not to come on stage, the fact that they decide not to intervene is itself a form of acting. 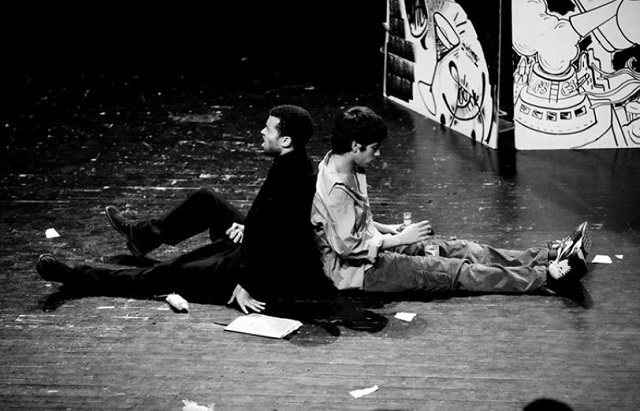 Boal theorises Forum Theatre as a type of question asked of the audience – in the form of a theatrical scene. The question should be as clear as possible. Participants are encouraged to formulate the conflict in advance, as a statement: “I want”. This kind of structure is common to all the variants of Theatre of the Oppressed. Other forms, such as ‘invisible’ theatre and ‘newspaper’ theatre also use theatrical spectacles to stimulate discussion of political topics. In Theatre of the Oppressed, the spectator is encouraged to “invade” the stage. The actor or director loses the ability to speak in monologue. Many forms of Theatre of the Oppressed, such as forum theatre and invisible theatre, remove the wall between actor and spectator. Earlier forms involved spectators writing scripts for actors on the spot, and rewriting scenes. Boal describes such an approach as transferring the means of artistic production to the people. In contrast to bourgeois theatre as “finished theatre”, Theatre of the Oppressed presents images of a world which can be transformed. It is never a finished spectacle. It is a work in progress. Hence, it models the world theorised in Boal’s view of the role of aesthetics, in which humanity and life are processual and incomplete. Boal favours the “invasion” of the stage because it combats alienation. Alienation is here seen as a reduction to a status of less than fully human. The traditional spectator is alienated in this way. S/he is less than fully human, because s/he delegates the power to act to other people. Theatre of the Oppressed “humanises” the spectator by restoring her or his capacity for action “in all its fullness”. It restores the spectator to equality with the actor – rather than treating the spectator as a passive receiver of an imposed, finished worldview. The invasion of the aesthetic space symbolises and prefigures the trespass, or seizure of power, needed to challenge oppression in other spheres. In other words, the split between powerful actor/director and powerless, passive spectator symbolises and instantiates the broader split between powerful and powerless. The role of the spect-actor prefigures a broader reversal of this relationship. Just as a spectator can become an actor, so workers can take over factories, students can teach, oppressed people can fight back against abusers, and so on. Boal goes as far as to say that we cannot be free without such an act of ‘trespass’, outside established roles and norms. This theatre assumes, or models, the possibility for change. Boal’s method transforms the relationship between actor and spectator. The aim is to democratise – not destroy – the stage space. Theatre of the Oppressed should create a dialogue between actor and spectator, rather than a monologue. The role of spectators is still crucial in creating an aesthetic space of observation. Such a space is created when others’ gaze is focused on one area, and is more intense the more are watching. Such a space is desirable. It has a power of enchantment. And it can signify a separate space which is invaded. As the name suggests, Theatre of the Oppressed aims to combat oppression. Oppression is both individual and general. Theatre of the Oppressed comes up against a problem that people are unwilling to publicly perform what they see as individual problems. Part of its work is to show that these problems are actually “plural”, rather than personal. They are social effects which have resonances with others’ problems. Theatre of the Oppressed moves from the individual to the general, rather than the reverse. Oppression is always modelled in terms of particular experiences. However, a good Theatre of the Oppressed session works with oppressions which are also suitably general. Part of the purpose of this selection is to move from problems to social causes, and to address these causes. Oppressions can be revealed to be general or universal, by finding which aspects of a particular situation are more widespread. Emphasis might also be put on social needs, rather than desires which are simply a matter of will. Personal problems are placed in a wider social, economic and political reality. Such distinctions and approaches are typical of consciousness-raising approaches of the 60s-70s era, such as feminist consciousness raising, militant inquiry, and Freirean pedagogy. The idea of oppression was straightforward in the early years. Boal was working against tyrannical systems with visible oppressors, such as military dictatorships, landlord-owned latifundias, and authoritarian workplaces. In these situations, there is an external oppressor who is easily identified, because this person uses violence and coercion to control other people. Later, the method was expanded for use in dealing with more complex situations, such as gender and family relations. In these cases, Boal suggests that conciliation is possible. Oppression is less obviously one-sided. More recent techniques, such as the Rainbow of Desire, also work with concealed and internalised oppressions. Although general oppressions are the best ones to address using this approach, it is also important not to give the impression that oppression is the same everywhere, which would encourage fatalism. Also, all oppressions should be treated as equally important. This is because they are subjectively important to those subject to them, and because others’ oppressions should not prevent someone from fighting their own. Forum theatre provides a kind of rehearsal for fighting oppressions one faces in one’s own life. Everyone is always the protagonist of her/his own life. Boal does not force people to participate, or exclude non-participators. However, he encourages everyone to participate. Absolute identity, where two people experience the same oppression. Problems like intimate partner violence and police harassment are common to many people, even if they feel personal. Analogy, where two problems are structurally similar. For instance, different kinds of workplace exploitation or police abuse might be analogical. Resonance or solidarity, where problems are simply reminiscent of one’s own situation, or the actor sympathises with a problem without having experienced it. In true “Theatre of the Oppressed”, only the first two types qualify someone as a spect-actor. Only in these cases is someone preparing for real resistance to real oppressions. However, resonance can also be used in Forum Theatre and other approaches, such as ‘Rainbow of Desire’, where the problems discussed are more personally unique. Boal also argues that part of the project of Theatre of the Oppressed is to interlink different groups of oppressed people. Transformative power is increased when different groups know and express solidarity with each other’s oppressions. Boal believes that fighting any one oppression is inseparable from fighting all oppressions. Any oppression provides a way into sympathising with oppressed people. For instance, Grace Telesco controversially tried to use Boal’s method with police recruits, to discourage brutality. The average recruit is very privileged and does not feel oppressed. However, their experience of subordination as recruits provided a way into the issue of oppression for them. This suggests that even very privileged people can sympathise with oppression based on resonance. Theatre of the Oppressed sessions often start with games and bodywork. Such activities are seen as creating a kind of communion, and existence as a group. Even in his last years, Boal still invented and appropriated new exercises, often borrowing traditional games from new settings. The function of these exercises is to destroy what Boal calls “muscular alienation”, and to perform a ‘de-mechanisation of the body’. This theory is similar to Reich’s concept of character-armour. In the course of work and everyday life, people adopt certain habitual bodily postures and repeat particular acts. The body produces a muscular mask in response to the stimuli it receives. People’s bodies are mechanised. Their muscle structures, posture, personality, and so on are rigid and constrained. Usually this rigidity reflects someone’s job or social roles. This structure means that emotions cannot manifest themselves expressively. A person who is rigid in this way is unable to act, in the sense Boal means. S/he can’t act creatively, because s/he always reverts to the constrained gestures of the constricted body. Boal exemplifies this idea in relation to work. Workers in factories, mines, farms and so on often form their muscular armour in terms of particular physical postures which are repeated. Miners have to crouch a lot, factory workers have to repeat certain movements over and over. Someone who works at a computer spends a lot of time sitting, with eyes facing forwards and hands at the keyboard. A fast food worker, in contrast, might be more mobile, but is expected to keep up particular appearances of happiness, to smile and say “have a nice day”. People might also get bodily structures from family life, consumption patterns, or recurring emotional states – from constant anxiety or hypervigilance, from physically sitting watching TV or doing standardised forms of exercise, or from housework or childcare. There are also corresponding psychological structures. Someone whose job involves sorting things, or filling forms, learns to think in categorising ways for example. These are the kinds of muscular rigidities and constricting roles people can pick up from repetitive actions in their lives. There is also a sensory equivalent to this kind of muscular rigidity. People filter reality in line with particular assumptions. These assumptions are culturally relative. They make habitual settings seem orderly. For instance, people raised in cities can filter urban stimuli, but not usually those of a jungle. On the other hand, someone who has always lived in a jungle will find it more orderly than a city. Such filters or breakers can act in a similar way to bodily rigidities. They predispose people to see or hear in particular ways, and to filter other things out as irrelevant. This sensory problem has its roots in categorisation. Boal argues that everything in the world is ultimately unique. But humans and animals cannot handle awareness of all this diversity. People need to use categories and habits to make the world more comprehensible, and avoid being overwhelmed. People also form expectations of conventional phrases, binaries, and so on – similar to computer cookies. They develop socially and environmentally specific sensory breakers, which select and structure the otherwise overwhelming input. These breakers mechanise people’s actions, repeating the same selections over and over. These are similar to what are called schemas in cognitive psychology. On a mental level, too, neurons which should be forming complex networks can become locked in the repetition of similar information. They can become closed circuits which refuse dialogue. Habit is not all bad. It allows people to act more efficiently. And it stops people from being overwhelmed. But it also reduces the range of bodily expression. For instance, “cookies” do not get on with genuinely creative, original artists, because these artists’ work frustrates expectations. There is therefore a need to undermine habit in art. Habit is exacerbated in today’s societies. Capitalism encourages habitual rigidity, because it creates more efficient, more robot-like workers. According to Boal, all of these habituated postures, and corresponding psychological habits, are alienating. They are a small subset of what the human body is capable of. They keep us, as people, trapped in our restricted social roles – which are usually imposed by capitalism and other oppressions. Boal insists that personal rigidities are not primarily matters of personality or essence. They are effects of social relations, or of habits. A form of bodily rigidity is the basis for a particular social role, or ‘mask’. For Boal, these rigidities restrict what people feel, see, hear, and so on. People start to feel little of what they touch, to listen to little of what they hear. The process of authentic hearing/seeing, and of dialogue and creativity, is stunted or blocked. To regain the ability to act (in the full sense), people need to re-harmonise their bodies so they can send and receive all possible messages. Actors need to learn to counter the usual tendency to synthesise reality in line with a particular standpoint or interest. Boal theorises games as sensory dialogue, which brings out creativity by breaking down muscular rigidity. Many of Boal’s techniques are designed to denaturalise habits and rituals which seem natural or ordinary. One source of oppression is ritual. Rituals are actions people perform without thought or passion, without their heart being in them. People are said to perform many rituals without recognising them as such. Often, rituals (or habits) have to be revealed before they can be questioned. Rituals include things like fighting, gestures of friendship, conventional forms of power, and so on. Examples of rituals might include clocking in at work, sitting down in class, saluting a senior officer, but also things like going to the pub every Saturday, reading a newspaper every morning, or always protesting in a particular way. Certain techniques help people see the rituals for what they are. Not all rituals are bad, but they should be seen and questioned. Many rituals take the form of social roles. When acting a role, people put on a particular “mask”, to cushion their relations while in the role. This isn’t usually a literal mask, but a kind of persona or social self, performed in a particular setting. Removing or modifying the mask is often enough to explode the ritual. Most people modify themselves in line with masks, and thereby constrain their self-expression. Sometimes this constraint is invisible, and theatre can reveal it. transforming one character into another. Often, rituals are not performed in their original form, but in a symbolic or surreal way. For instance, resistance to workplace agitation can be performed as putting a bag over one’s head or fingers in ears. Another source of oppression is fear. Oppression continues because of the hold it exerts on its victims. Boal suggests that oppression is only possible because people value life more than liberty. People are oppressed because they tend to make concessions to prolong their lives. If someone is unafraid, they might be killed, but they cannot be oppressed, because they will not accept oppression. Exceptionally brave people are fearless even when captured by enemies, but most of us accept intolerable conditions because of fear. Fear creates a kind of general vigilance, conditioning how people live. For the other essays in this series, please visit the In Theory column. Good to see A to Z in one article. Will read it properly and come back to comment.